Hard work and a recommitment to the sport has shown Miller Grove GA senior Ken Gilstrap – and the rest of the track world – what he can do in the dashes and the relays. Gilstrap was an outstanding sprinter as a youth and in his first two years of high school, earning a spot on Team USA for the World Youth Championships in 2007. In Ostrava, he acquitted himself quite well, winning the bronze in the 100 (10.65), placing 6th in the 200 (21.63), and running on the gold-medal-winning medley relay. Then came a junior year that was marked by some injury issues and what Gilstrap himself terms “complacency” and a lack of “execution.” This winter, he obviously put in some extra work and made sure his senior year would be his best. Though he ran well at NSIC, placing 3rd in both dashes, that indoor championship really served more as a motivator to even bigger things. Mid-spring, he cranked a 10.39 that still serves as the legal U.S. leader and marks of 10.31 and 20.98 (without wind readings). This weekend, he hopes to win both dashes at the Georgia state meet as well as anchor his teammates to a winning (and possibly nation-leading) 4x100. Miller Grove has already twice run #1 times in that event this year. Also a football standout, Gilstrap has signed with Middle Tennessee State to do both sports. Before he headed to Jefferson, he shared some thoughts with DyeStat senior editor SteveU. 1) You’ve had a very strong and consistent year so far, with lots of 10.3-something 100s and 200s in the 21-range or just under. What specifically have you done in terms of both your track training and off-track training (weights, etc.) to get faster and more consistent? I have really just focused. I have evaluated myself, and took in the good and the bad, and put some of the pieces together mentally. On the track, I have just did what my father instilled in me, which is to work hard, and also took in some new concepts from my coaches to help me be a better sprinter … but I have a lot to work on. 2) At NSIC in March, you were right in the thick of things in the 60 and 200, but ultimately got 3rd overall in both. What was your reaction to those placings and were those results something you used for motivation to really come out strong outdoors? Yes, they were. I’m a competitor, and I always want to win, and that really just showed me that I had a lot to work on. Jeremy Rankin and Rynell Parsons are great athletes and they were the faster men on that day. 3) Going into the state meet this weekend, what are your goals in terms of placings and times? And what kind of post-season schedule are you looking at right now, in terms of Nike or USATF meets … and what would be your goals there? My goals this weekend is to win everything and just leave a stamp as the greatest performer at the Georgia state track meet. Individually, I want to win my events and break state records, but my number one goal is to win the team title for my school and my community. 4) At Miller Grove, you and your teammates have really put together a super 4x100 this year. Can you tell us about each of your relay teammates and what they each bring to the table? What part have you played with this group as far as senior leadership? This year’s 4x1 is made up of tremendous athletes. My teammates are my brothers; we fight and work hard at practice. The 4x1 is made up of five guys that can put down at least a 10.8 100 meter dash. Jonathan “Lil Man” Norris - He is the next great Miller Grove Sprinter and only a sophomore. He is my lil brother; he’s a small pocket rocket that is hungry. He can’t run the open 100, because only two can participate, so I guess he takes it out on the 4x1. Antoine Cantrell - He is a junior at Miller Grove. He is a long sprinter. He is smooth and puts down a 48 second 400 meter dash and a great 200 meter dash. He is just one of those guys that can just run. Kendrick “Miami” Ings - He brings what you call the swagger to our team. He is a senior two-sport athlete that is running a 10.6 100 meters and a 21.6 100 meters. No matter what it is, he thinks he is the best. Everyday at practice when I step against him he pushes me to the limit. Stephen Hill - He is a 6’5 three-sport athlete and a Georgia Tech football signee. We have been brothers since we were 5 years old. He is a 24-foot long jumper and probably will jump 25 feet at state. He was the fastest kid in the nation at 10 years old and still has the same foot speed. He is the man when he does anything athletic. Without this man, I would not be where I am today. 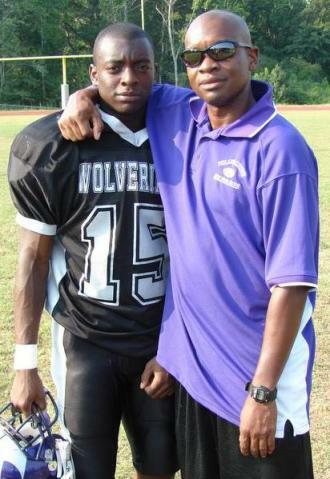 5) I know you work with Coach Tony Carpenter with the Titans TC, which has produced an incredible number of outstanding athletes over the years, but obviously you have a commitment with the school team at Miller Grove. Tell us how that club/school thing works out … do you train with the club so many days a week? Does the high school coach and Coach Carpenter consult together on your training and racing? I always wonder how that works out with athletes who compete seriously with a club? Well, training-wise I am blessed to have good high school assistant coaches (Dillard, Upshar, Rodgers, and Keddo), but my high school head coach Kenneth Bailey is my coach during the high school season. He pushes me and makes me a man off the track. Then during the summer, I train with my father every morning and Coach Tony also trains me. So I have a great group of trainers. Coach Tony is a great man; he has really educated me on many different track concepts and is really my track teacher and is always wanting to see a record. But my father has groomed me and has installed the idea that hard work is the way to be successful. He is the reason why I am here today, so I thank God for a great father. 6) I read some about your football background, stats, etc., from some of the recruiting web sites. It looks like there was consideration from several schools and that the process might have been a challenging one, with some SEC schools in the running, before you landed at Middle Tennessee. Can you tell us some about that? Was there an issue of where you could play both football and run track? What wound up being the key factors for you in making that final decision and how important is the football to you compared to track? Well, being a multi-sport athlete is what I do. I never focused on one. But through the recruiting process, I knew I wanted to play football, so the recruiting process was real fun. It’s like a lot of college coaches overlooked me and always tried to find someone taller or a little faster or bigger, so that just motivated me. I received track offers, but the two I considered were South Carolina and Kentucky. South Carolina just wanted me to run track and Coach Aaron Tucker did try his best to get me a football offer, but it never happened. So I didn’t get attention;I ran fast times and fast 40s, but recruiters seemed to want something else. Then Middle Tennessee just kept recruiting me; they knew what type of athlete I was and Coach Willie Simmons and Rick Stockstill recruited me hard. Yes, I did think about stopping playing football, but after I started my senior football season off and started putting up numbers that ended with about 1,000 all-purpose yards and 10 touchdowns and over 50 tackles, I told myself, Why stop? Don’t let some silly recruiting process stop what God blessed you with. So I went and always took the approach to outwork the next man. I made All-American in football and still got overlooked. So I’m taking the approach that I’m going to go to Middle Tennessee and be the best athlete I can and beat the big guys. So the only thing that will stop me from running is a shoe contract, lol!! 7) You had a quite a season as a sophomore, capped off with a 100 bronze in the World Youth Champs and a relay gold as well. When you think back to that experience, two years ago now, what were the most important things you learned from it as a sprinter? What are some of your favorite memories of that trip? I learned what sprinting was about. That was an honor to go overseas and accomplish a goal. I felt I should have won that race, but I still give God the glory because I was an alternate and just went out, and worked hard, and came in and showed the world I can run. 8) It seems like after the success of that season, your junior year wasn’t quite as much of a step up as you might have liked, but that you’ve made a lot of progress this spring as a senior. Is that observation on target? Was there anything injury or health-wise that held you back as a junior? Or some changes you’ve made as a senior that helped you improve? Well, I really battled injury since my freshmen year, so I just never really let things heal. But no excuse; I just didn’t execute last season. I got a little complacent and took things for granted and I look back and say, Dang, I am behind. This year I just went back to the old me. I just got hungrier and noticed I am not running for myself. I run for GOD, and to provide for my loved ones in the future and have fun while doing it. 9) If someone was to do a video feature of Ken Gilstrap’s life “off the track” (and off the football field), where would it take the viewers and what would they find you doing? What are some things about you as a student and as far as what you like to do when not training or studying that people might find out? If you did a autobiography on me, you would find a lil boy who has grown up around the game and just loves to compete and give love. Outside of sports, I just pray, eat, sleep, and dream. Yes, I have a social life and I like girls, but everyone knows the goals I want to accomplish, so I really just dream all day. I can think about winning one race all day and I dedicate my life to athletics because that’s my purpose. As a student, I do my work and make good grades, but without that ball or baton in my hand I wouldn’t take the same approach to the classroom. So, in conclusion, sports is my life.